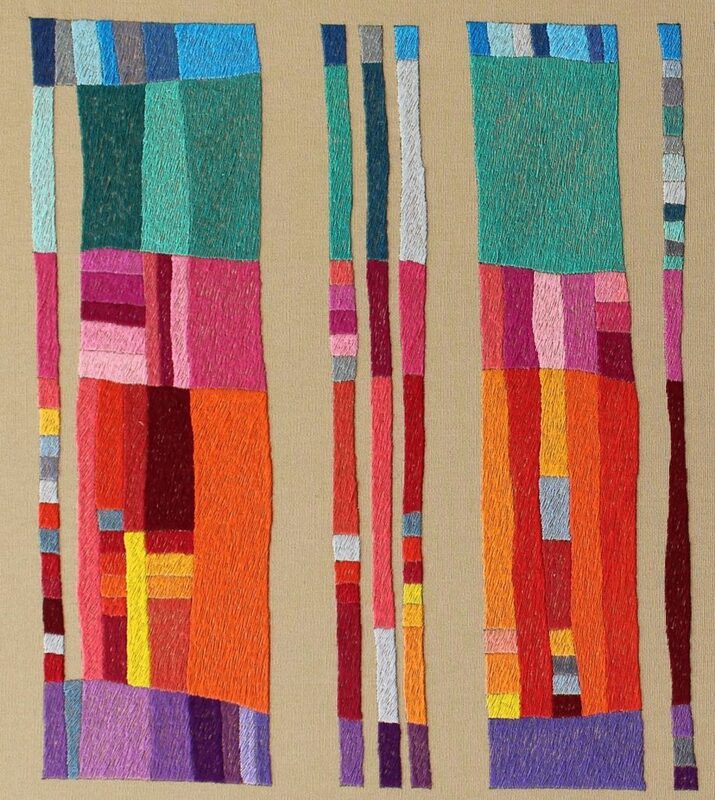 Contemporary fibre artist, Victoria Potrovitza grew up in Romania where she was exposed to hand embroidery and traditional creative textiles. 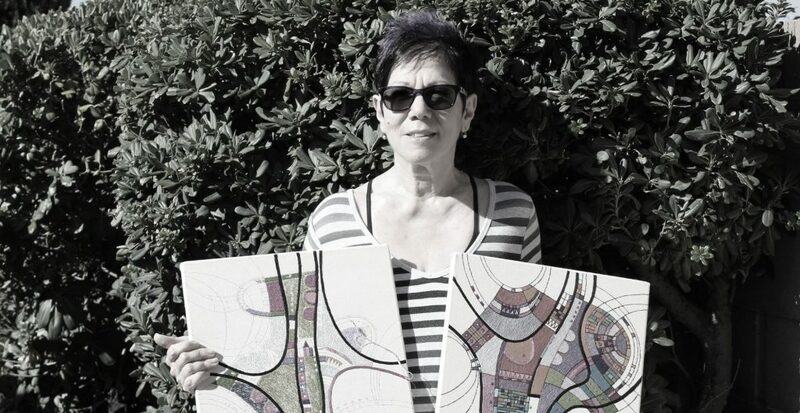 With an MS in architecture Victoria is arguably a naturally gifted artist and visionary. 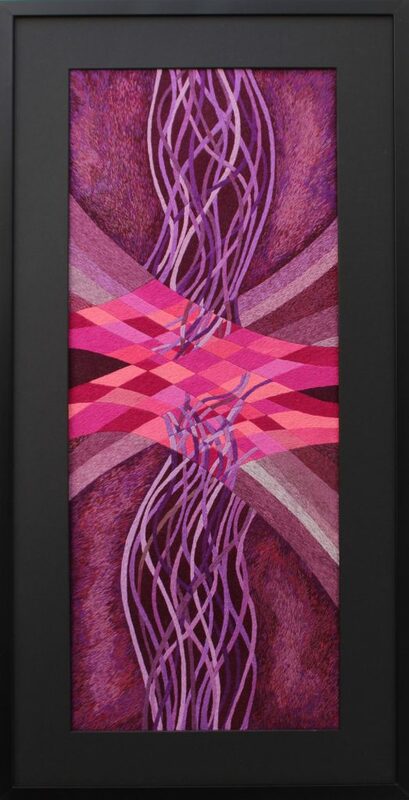 Although her calling was always in textiles it was only through experimentation and exploration that Victoria became the contemporary artist she is today. 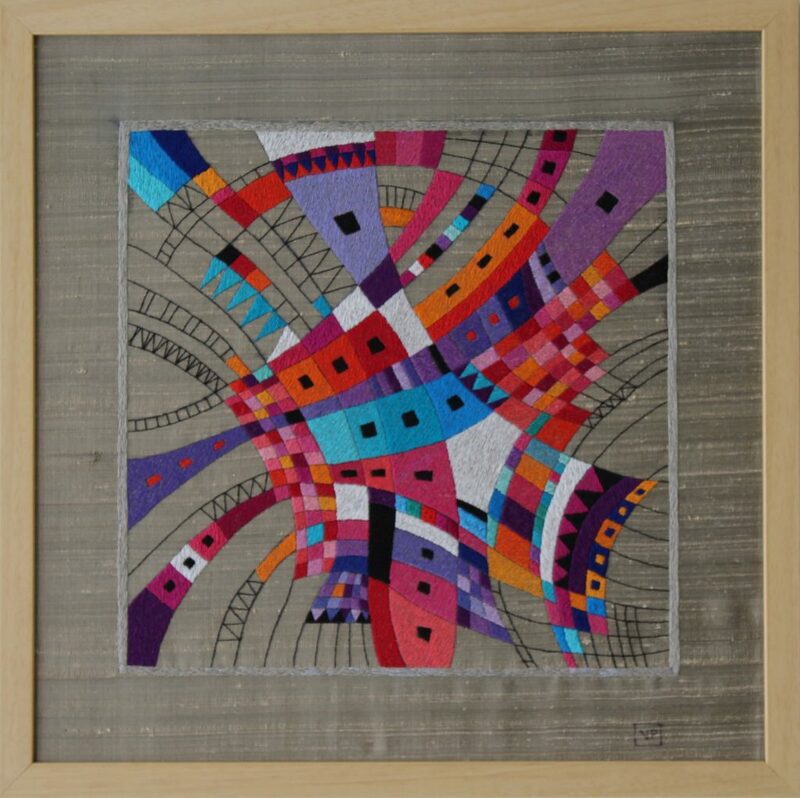 Her abstract vision, organised compositions, vibrant colours and contemporary form distinguish her pieces from many hand embroidery artists. Today she talks to us about her love of modernist artists, her early influences and how the structured world of architecture give her the confidence to later embrace creative freedom. How did you get into hand embroidery? What is your background? 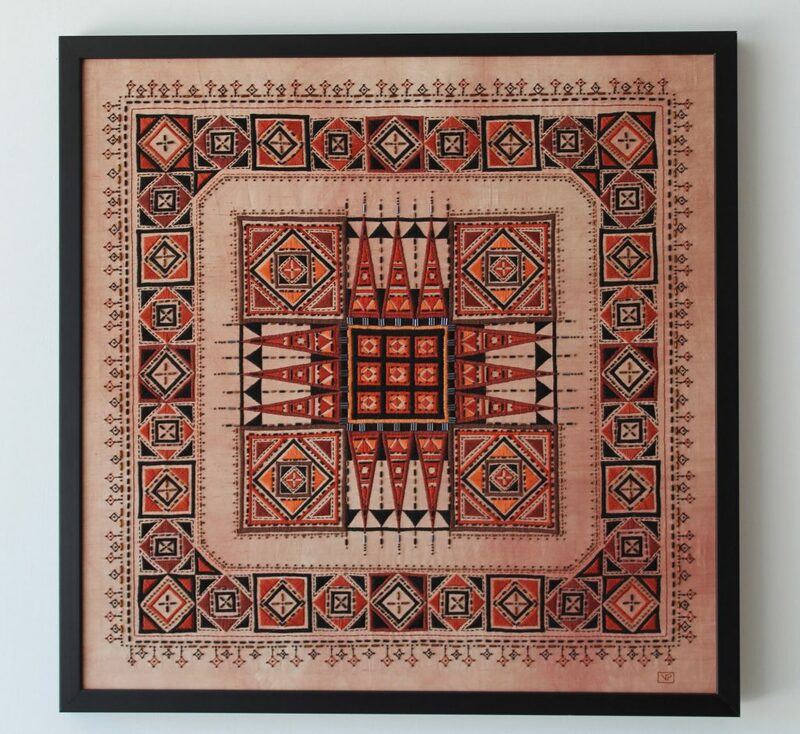 ‘Growing up in my native country, Romania, one of the few highlights of my education were the embroidery and hand stitching classes included in all levels of the school curriculum. As a fundamental element of the Romanian cultural traditions I learned and practised hand embroidery. 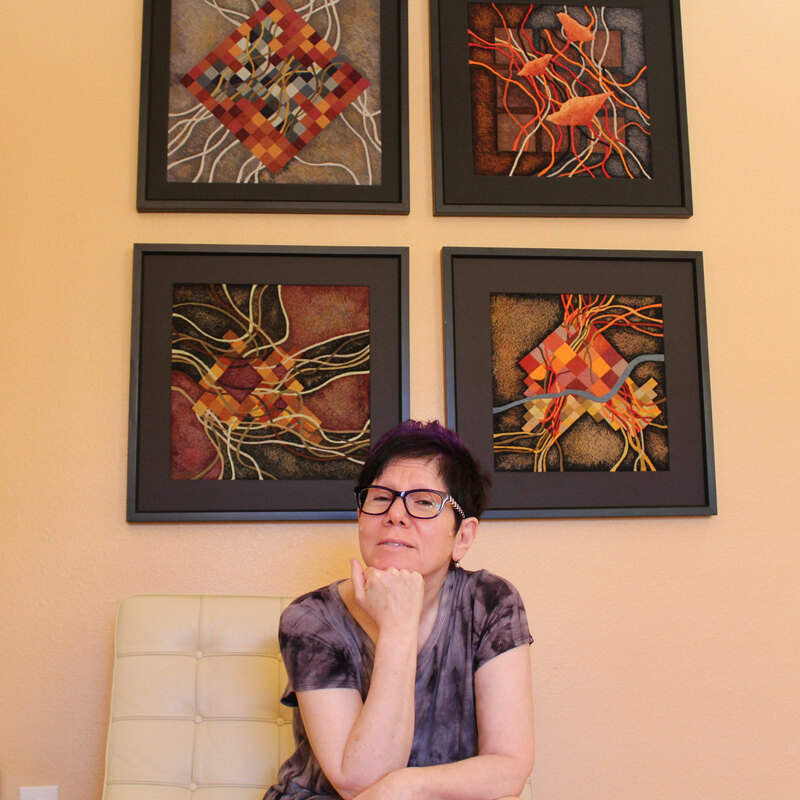 I searched for and examined old hand woven and embroidered beaded pillows, tablecloths, rugs and other items surrounding me, which were part of my family inheritance going back generations. Inspired by the artistry of these works, I started making my own designs. 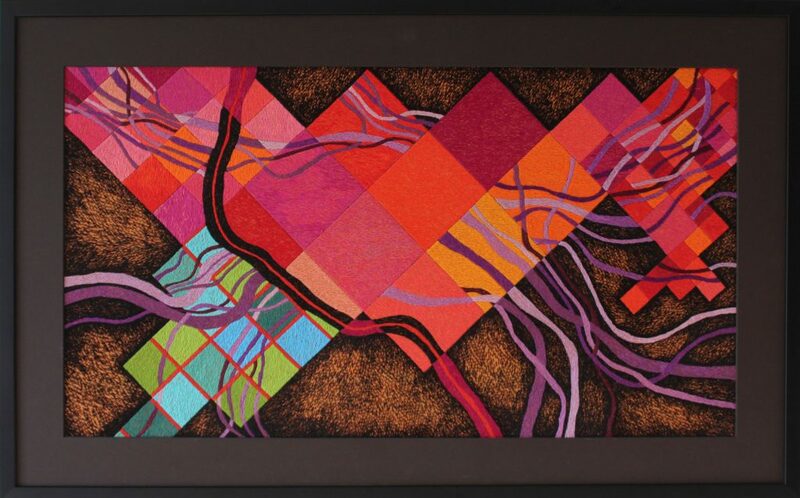 Did you ever study hand embroidery formally? Tell us more about your process for creating your pieces? 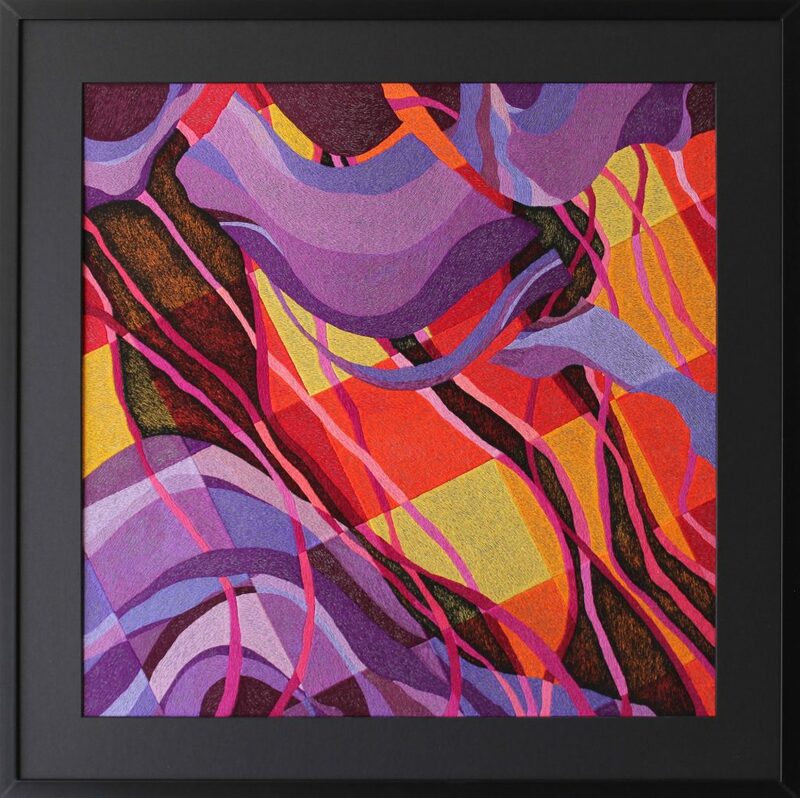 ‘I stretch canvas or heavy silk on rectangular wooden frames to form my blank “piece of paper”. A sketch made with a pencil provides the outline of a future piece. 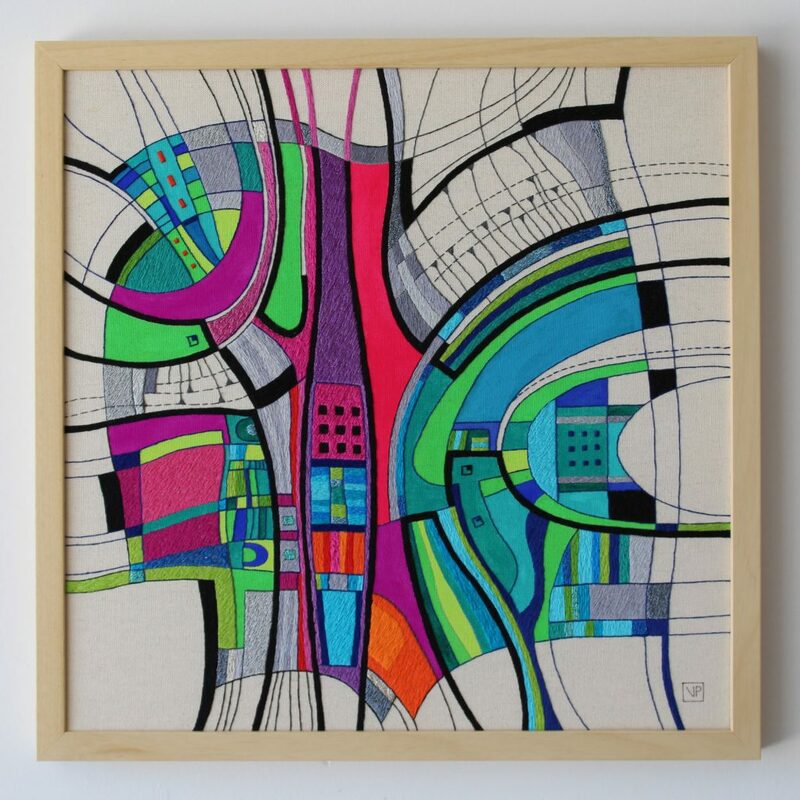 As I lay the threads, one stitch at the time, the composition takes on a life of its own, evolving beyond the original sketch, to morph into a work of intuitive creation. 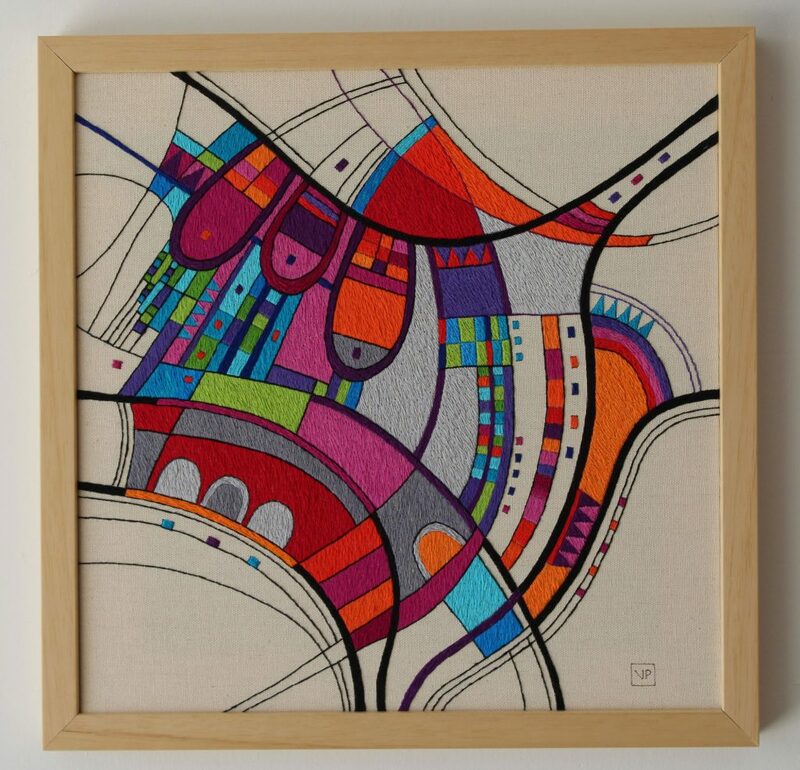 To obtain more vibrant shades, I stitch multiple coloured layers of threads on top of each other like I would mix colours for a painting. I’m using the same process to give depth to certain areas, playing with positive and negative spaces. Do you think that your previous work in Architecture inspires your pieces? ‘As an abstract artist I’m forever grateful to the pioneers of the modernist movements that developed in the beginning of the twentieth century, the avant garde Russian suprematism and constructivism. The Bauhaus Textile School is the cornerstone of my inspiration. ‘Sometimes, my design starts with sketches on tracing paper. I start drawing geometric shapes connected by flowing lines, not sure how the composition is best balanced and harmonized. I lay a new sheet of tracing paper over the sketch and try variations of the same design creating series of related works. My sketches are black and white. Lately, I have started to make attempts to colour some areas using pencils, but I have a difficult time matching the brilliance of the DMC cotton threads, so I prefer to make colour choices during the stitching process. Other times, I sketch directly on canvas. I sketch the outline of a composition with a disappearing ink pen that allows me to make changes to the design as the stitching progresses. Most of the time I make changes to the design, so I end up with something quite different from the initial design. Would you say that your own personal style developed progressively? 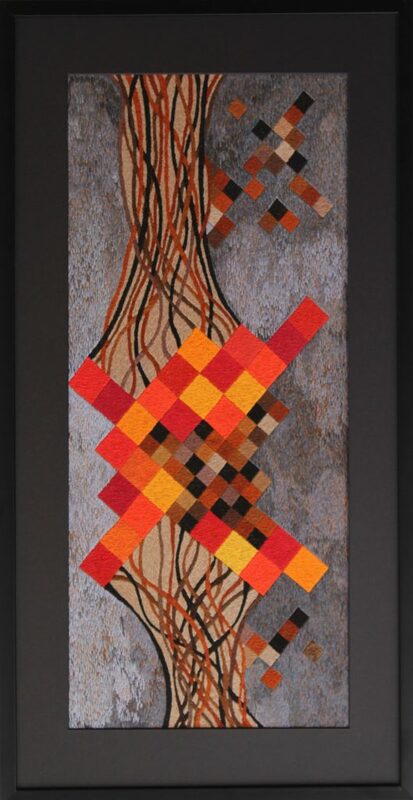 As a textiles artist do you ever have days when you feel less motivated? Do you have your own studio space or a particular place you like to work in? What advice would you give our students on developing their own creativity and style? 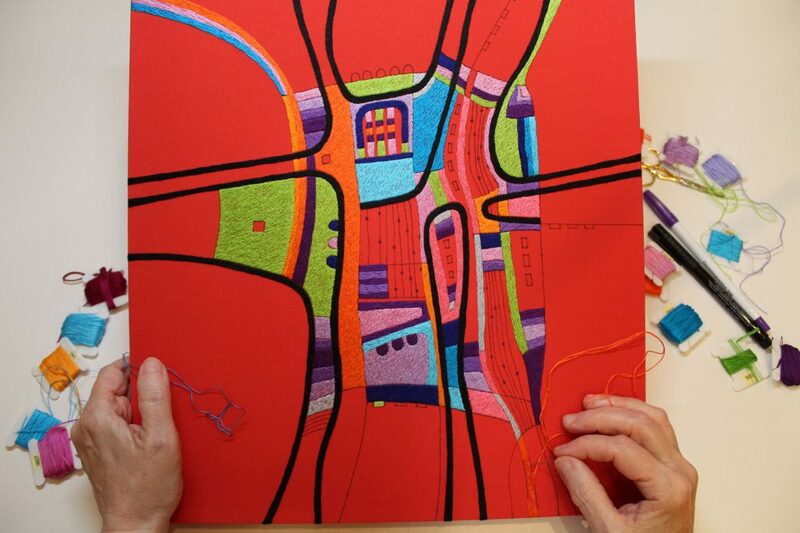 Ten of Victoria’s pieces have been selected for the World of Threads Festival 2018 which is an international showcase of contemporary fibre art. Victoria also has a solo exhibition in the Corridor Galleries of Queen Elizabeth Park Community & Cultural Center, Oakville, Ontario, Canada – October 13, 2018 to December 31, 2018. You can find out more about Victoria and view her work by following her Facebook page, on Pinterest or by Saatchiart. 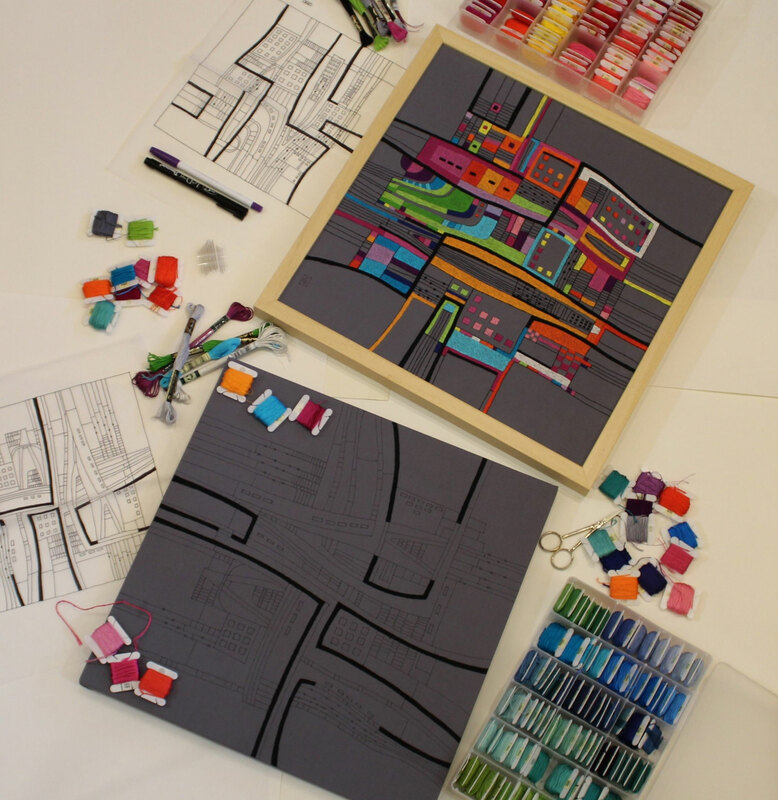 If you’re feeling inspired then why not check out our range of accredited textiles courses.